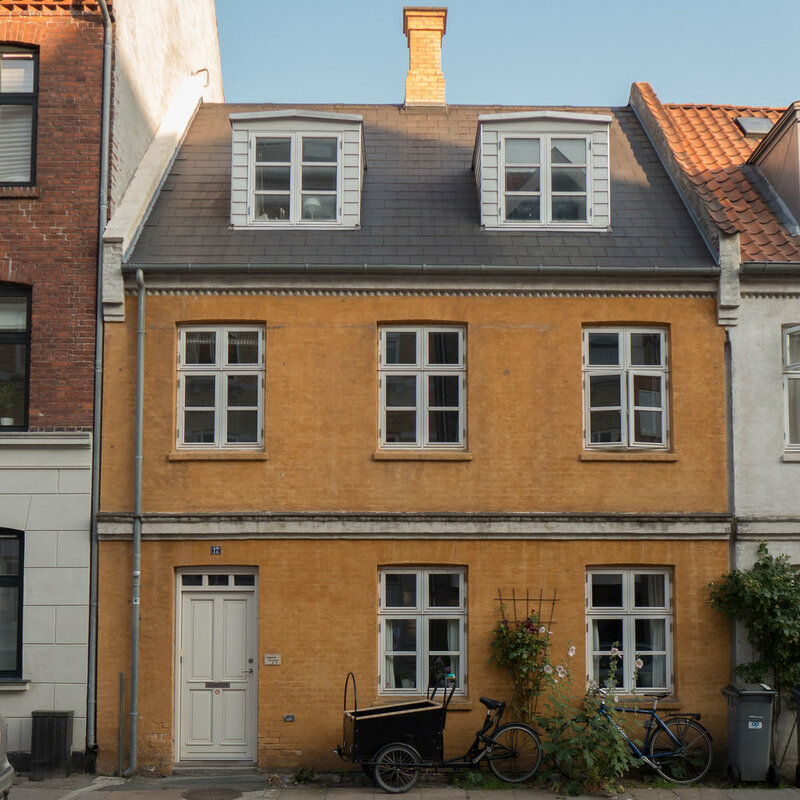 The row houses in Lyngbyvejskvartet / Lingbyvej Quarter were built by the Workers Building Association between 1906 and 1929 for workers from Burmeister Wain and the architect was Christen Larsen who had replaced Frederik Boettger as architect to the association. Lyngbyvej - the King's highway - is an important and historic road that runs out north from the city to Lyngby and from there on to the royal castle at Frederiksborg. 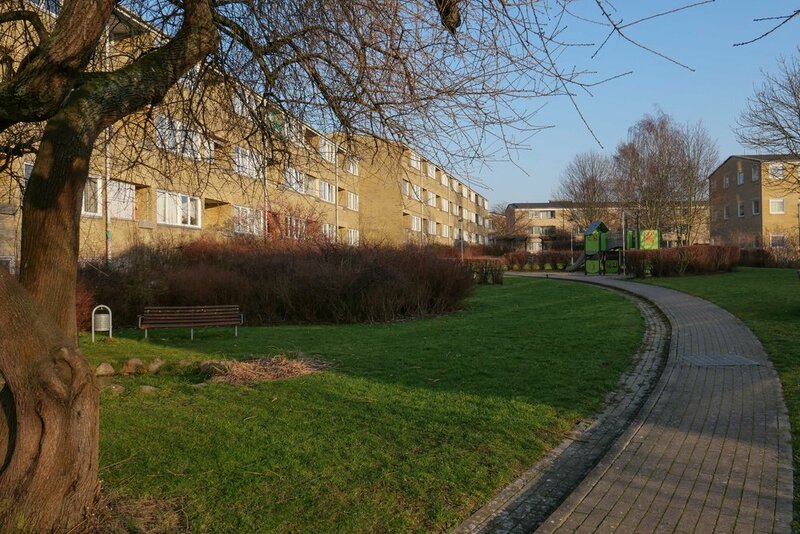 The housing is about 4 kilometres from the centre of Copenhagen. In a modern city this might not seem far but until the city defences were dismantled around 1870, the historic core of Copenhagen, on this side of the harbour, was confined to an area little more than a kilometre from the wharves to the north gate and around 1.5 kilometres across from the east gate to the west gate with remarkably little building outside the defences …. so this was quite a long way out of the centre for workers employed at the engineering works of Burmeister Wain on Christianshavn on the far side of the city or for men working at their ship yards at Refshaleøen. Workers' houses on Sverrigsgade were built on a narrow and oddly-shaped strip of land between Hallandsgade and Brigadvej that had been owned by the veterinary school but, shortly after they moved to Frederiksberg in 1858, it was sold at auction, in part to private buyers and in part to LP Holmblad the manufacturer of candles, soap and paint. A new road, then called Nygade - New Street - was laid out with two sharp angles along the length and Holmblad built houses and a school at the far end of the street on the north side of which two pairs of houses survive. Land on the south side of the road was sold to the engineering company Burmeister Wain and they were responsible for the building of the rest of the workers' housing. There is a drawing in the national archive - Danmarks Kunstbibliotek - of an initial scheme designed by the architect Henrik Steffens Sibbern and dated 1866. This is one of the more extraordinary buildings in Copenhagen. It is at the east end of Trianglen on the traffic island and was a tram car stop with a kiosk; a room for a traffic controller and public toilets and with benches not only in the recessed spaces on the east and west sides but also around the outside where people could wait if they had to change trams at this busy interchange. 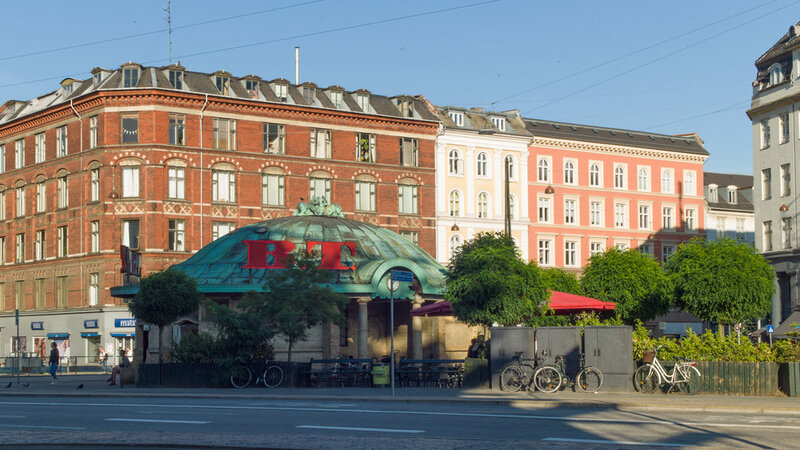 The architect was PV Jensen-Klint and it was commissioned in 1904 by the Østerbro Grundejerforening or Landowners Association to replace a wooden hut on the same site. A number of designs were presented before a final design was approved and the building was completed in 1907. It has a sort of exuberance and delight in playing with variations of shape and form that is associated with Art Nouveau architecture but here the columns on each side with strong entasis - the bowing out in the middle - and the almost Baroque elements with curved shaped heads to windows and doors picked up in the line of glazing bars makes it more robust and strongly architectural than buildings you would find from the same period in Paris or Brussels. The oval shape of the building and its copper roof meant that it was soon given the nickname of the Super Terrin or Terrinen although it is also known as Bien from the name of the kiosk here at one stage. Just beyond Enghave Park and below the site of the Carlsberg Brewery and called Humleby - literally Hops Town - the 235 houses were, in fact, not built for the brewery but were built for the Workers’ Building Society, to provide healthy homes for the workers at the engineering company of Burmeister & Wain. 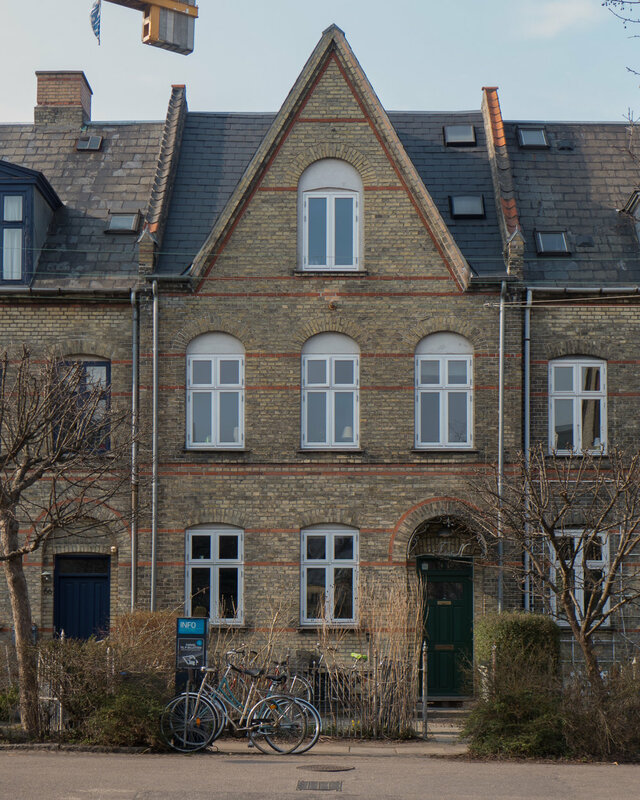 Designed for the society by Frederik Bøttger, work started in 1885 and the houses, were completed by 1891. 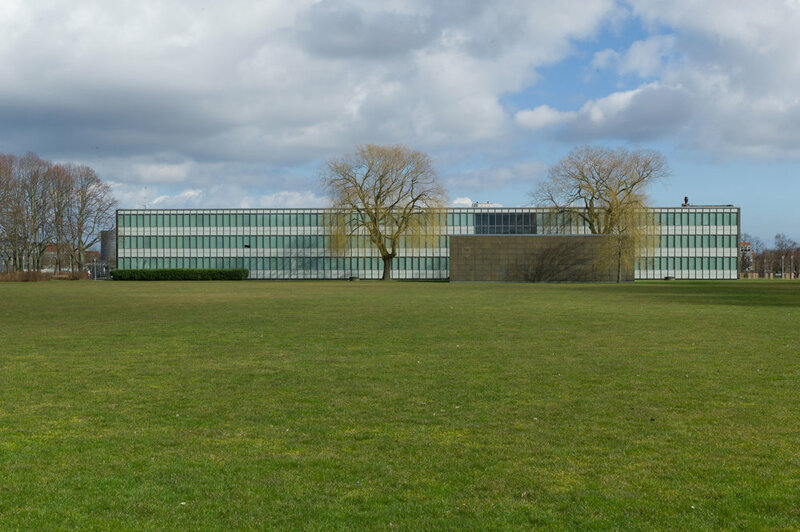 In 1988 Søren Robert Lund, a young architecture student then in his mid 20s, won a competition to design a major new gallery for modern art in Ishøj that was to be built in a coastal park on the shore of the bay, about 15 kilometres from Copenhagen to the south west of the city. A final design was agreed in 1992 and the gallery opened in 1996.